The CANM8 CANNECT HIGHBEAM-3R interface is a 3 output CAN Bus interface which provides a quick solution for detecting high beam activity on vehicles which feature CAN Bus wiring. The HIGHBEAM-3R interface also features outputs for ignition-on and reverse gear. This interface features "Key-In" detection with compatible vehicles enabling the ignition-on output to remain active when the ignition is turned off but the key remains in the ignition. Reverse Gear > 12v (1A max) when reverse gear is selected. 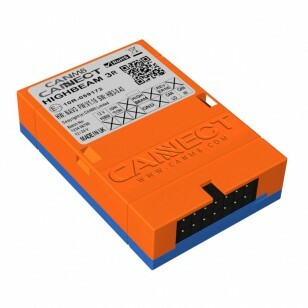 The CANM8 CANNECT HIGHBEAM-3R is an ideal solution for vehicles which require the installation of additional driving lights (via a relay) which are switched on when the vehicle high beam is active. This interface allows quick and easy installation which integrates the control of additional driving lights with the vehicle's high beam control and other accessories that require Ignition On and Reverse Gear sensing. GREEN > High Beam Output : 12v (1A max) when the high beam is active. BROWN > Reverse Gear Output : 12v (1A max) when reverse gear is seleceted.